Quick analysis of the A6 SoC photos from the iPhone 5 launch event tells us all we need to know about the memory interface, speed and bandwidth of the new platform. As always, the A6 features a PoP stack combining the SoC itself and its DRAM. The package-stacked DRAM helps save space, which comes at a premium inside a device as small as a smartphone. PoP stacks are quite common in all modern smartphones. Apple thankfully didn't obscure the details of its A6 slide at the launch event, which gave us a Samsung part number: K3PE7E700F-XGC2. Through crafty navigation of Samsung's product guide, Brian Klug got us the details. The K3P tells us we're looking at a dual-channel LPDDR2 package with 32-bit channels. The E7E7 gives us the density of each of the two DRAM die (512MB per die, 1GB total). The final two characters in the part number give us the cycle time/data rate, which in this case is 1066MHz. Roughly 33% more peak memory bandwidth than the iPhone 4S, which can definitely help feed the faster GPU and drive the higher resolution display. Many vendors have been shipping LPDDR2-1066 so there's nothing too surprising here. There's understandably less bandwidth than in the 3rd gen iPad of course as the display/GPU requirements aren't nearly as high. 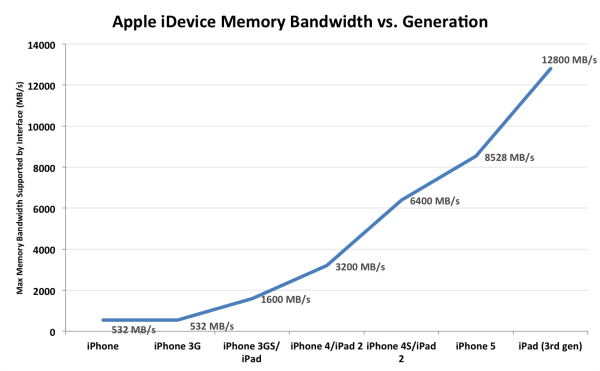 There's more than just memory clocks that will impact memory bandwidth here. It's unclear whether the A6 improves the memory controller Apple deployed in the A5. ARM architectures (especially in the A9 generation) have typically struggled getting good memory bandwidth efficiency. We'll have to see what happens with the A6. Yes, there are two iPad 2 models. Thanks for all the sleuthing! If you guys get any more info on the 5th generation iPod touch, a lot of your readers may be interested. I'll probably never buy an iPhone but this will be approximately my sixth iPod (including my old mini which upgraded from a CF sized hard drive to a CompactFlash memory card). I have sold or given away most of those iPods but the latest touch (w/the nice screen) really appeals to me. Which goes to apples concern: there are supposed to be firewalls between the mobile group and their component business. Pretty sure the ad people aren't involved in either of the Samsung business groups when it comes to components and mobile development/design. Memory is also sold by Samsung Electronics not the Foundry services team. So memory chips are sold by the same business group that makes phones. Foundry services do exist partly in another company though. Head office still has lots of the responsibilities. It's up to Samsung Semiconductor, Samsung Electronics and Apple to agree to the terms and if they are gonna keep quiet about stuff, component manufacturers normally don't they boast about stuff months if not years before delivery. Even still the foundry people and memory/packing people would know nothing about the physical design of the finished product. If they do then surely Apple is to blame as they don't have NDA's covering such areas even and it's Taiwanese firms that do the casing. It's also not the component engineers and people that will make decisions for the phone developers, they will have to make their own decisions and will be able to use any technology their parent company owns or license. Sorry but it seems Apple were most likely responsible for more leaks on iPhone 5 than anybody on the web. I mean it really doesn't take much to get the low down on what going on with Apple lately! Like I was just minding my own business going over Qualcomm S4 info on the web. Low and behold I stumble upon this link on Qualcomm's Austrian Developer site and what do it see? This little tidbit about iOS and ARMv7 ARMv7s. So apparently it seems A6 may have S4 Krait cores in it, instead of Apple's own custom cores!